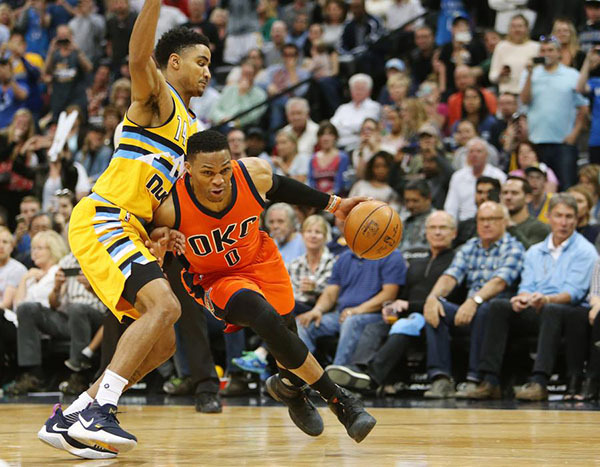 Oklahoma City Thunder guard Russell Westbrook (0) drives to the basket against Denver Nuggets guard Gary Harris (14) during the second half at Pepsi Center in Denver on April 9, 2017. The Thunder won 106-105. Russell Westbrook broke Oscar Robertson's 56-year-old record with his 42nd triple-double of the season Sunday, then broke the Denver Nuggets' hearts with a buzzer-beating 3-pointer for a 106-105 victory. Westbrook had 50 points, 15 rebounds and 10 assists in breaking Robertson's record of 41 triple-doubles that had stood since the 1961-62 season. Westbrook's record-breaking assist came with 4:17 remaining after a series of missed shots delayed his historic moment. With his triple-double in the books, Westbrook scored his team's final 13 points, including a 3-pointer as the buzzer sounded after a timeout with 2.9 seconds left.